As we've been telling you these past few weeks, all indications are that this year we will again breaking records on the Camino de Santiago, surpassing even the numbers of the last Holy Year, with around 200,000 pilgrims walking the pilgrimage route. But what differentiates a pilgrim from the XXI century with one of the Middle Ages? What moved us to the gates of Santiago de Compostela hundred years ago and what it does now? 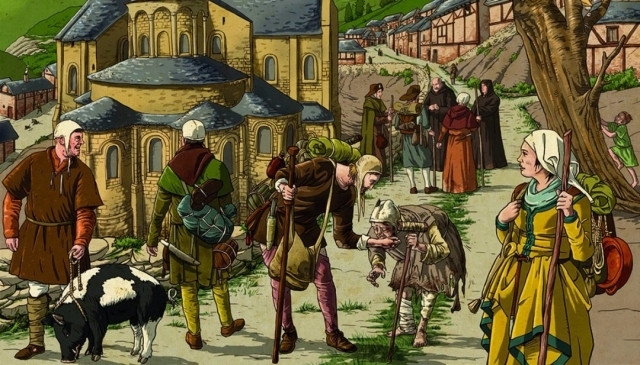 As told in the book 'Pilgrimage to Compostela in the Middle Ages' (Fundación Santa María la Real del Patrimonio Histórico), the historian Jaime Nuño and illustrator Chema Román (whose illustration you have above), pilgrims really seek similar objectives to ours. Anyone would think that walk the Camino in 2016 is much more linked to tourism reasons, sports and leisure, in contrast to the motivations of faith of the Middle Ages, but the fact is that as between the V and XV centuries some pilgrims looked for the holy city in search of adventure attracted by the stories of the pilgrimage route. Logically, the most common reasons we find in the the expiation of sins and pure religious devotion, but we're also surprised to discover that many pilgrims found themselves on the Camino to receive a inheritance or as a result of a sentence imposed by a court. So, some pilgrims had to reach Santiago de Compostela without means and in precarious conditions to cleanse their sins and so be at peace not only with his faith, if not justice itself. Now even having many things in common with all pilgrims of all time, certainly medieval they fought with a Camino full of dangers and headaches, especially taking into account the difficulties of European travelers to communicate with the people of Spain and understanding their traditions. One of the biggest problems was the high cost of spending weeks and months on their pilgrimage, coming back from Santiago to its point of origin (if they ever returned). However, the greatest danger in the route were the muggers and thiefs who even attacked armed pilgrims, whatever their condition (the pilgrimage to Santiago attracted equally to peasants, beggars, nobles and kings). pero este articulo que quiere decir? que también ahora hay asaltadores de peregrinos y maleantes en el camino?